The subject is derived from Homer's "Iliad," but it is widely believed that Rubens' composition is drawn from Ovid's narrative in the "Metamorphoses." The goddess Diana has taken insult over the Calydonian king's failure to pay her tribute during the harvest festival. To avenge herself, she sends a ferocious boar to ravage the land. The king's son Meleager, accompanied by the bravest warriors, seeks to destroy the creature. Atalanta, the beautiful virgin huntress, joins the hunt and is the first to wound the boar with her arrow, much to the chagrin of her male competitors. In this oil sketch, or "modello," Atalanta shoots an arrow at the deadly target while Meleager prevents the boar's escape with his spear. Rubens imparts a sense of immediacy through the use of rapid and spontaneous brushstrokes. Such a vigorous technique typifies the lively flavor of the Baroque style and distinguishes the "modello" from the larger, finished painting in the Kunsthistorisches Museum in Vienna. ?Orleans et al. contract sale (London, April, 1793, lot 248). ?Charles-Alexandre de Calonne (sale, London, Skinner and Dycke, 24 March 1795, lot 19). ?Sir Henry Rivers, 9th Bart, Kent (d. 1851). Mrs. Macmurrough Kavanagh, Borris House, Ireland. And from the wound appear'd the trickling blood. After killing the boar, Meleager presented Atalanta with its hide, infuriating the male hunters, including his two uncles. Outraged by his relatives’ envy, Meleager slew them, setting in motion his own demise. 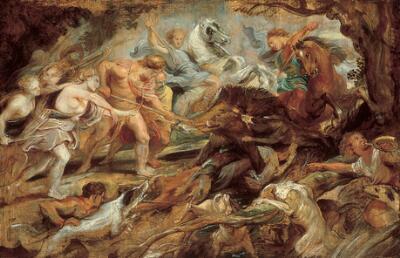 Rubens depicts the ferocious fight with great bravura. Frenzied action swirls around the animal as it fights for its life. Rubens uses rapid, spontaneous brushstrokes to add to the tension, suppressing detail in favor of a vivid impression of the struggle. Oil sketches, or modelli, like this one were key to Rubens’ working style after 1608, when assistants often executed his final paintings. He first worked out his ideas in pen drawings, then developed them further in oil. Modelli were considered the purest representation of an artist’s original invention—as such, they were highly valued by collectors. To learn more about Rubens’ brilliant personality, press 1531.